Continuing with my Ottawa Hospital Food Series, today I bring you The Greenery, otherwise known as the Ottawa Civic's cafteria. Not surprisingly, much of it was junk. And that's just the obviously unhealthy stuff. While I was recording my brief video some folks alerted the cafeteria manager who cut my taping rather short. She was extremely pleasant and helpful and clearly was very sincere in her desire to provide a good dining experience for the cafeteria's patrons. She was excited to tell me that the cafeteria offered smaller poutine/french fry portions in 4oz containers - but was unable to tell me why it was important for a hospital of all places to serve poutine. She was also excited to tell me that they've recently posted nutritional information on their soups. While I don't have a picture, the information was located on a laminated card that was actually not visible as it was tucked between items and was on its side. Cheddar Cheese and Bacon Soup - 170 calories (that's fine), 10grams of fat (45% of it saturated and 30% (3g) of it trans) and 1,150mg of sodium. Hearty Chili Style Mix with Beef - 230 calories, 1,540mg of sodium, 2 teaspoons of sugar. Garden Vegetable Soup with 70 calories but 970mg of sodium! Breaking out my calculator I found that the average amount of sodium in a soup choice at the Ottawa Civic cafteria is a brain swelling 957mg. That's 42% of your total daily Health Canada recommended daily maximum and 64% of your total daily Blood Pressure Canada recommended daily maximum in a tiny bowl of soup that you just bought at a hospital of all places and in many cases it came with an artery clogging amount of trans fats for added bad measure! Is there really a good reason why a hospital would serve soups with 3 grams of trans fats and a day's worth of sodium? Boy oh boy, after seeing the nutritional breakdown for soups I'd sure hate to see the breakdown for the burgers, fries, pizzas, liver steaks with onions, giant gobs of mashed potatoes and other cafeteria fare - good news I suppose that I'm told they don't have those numbers. Oh, and of course there's a Second Cup at the Civic serving gigantic as-many-calories-as-a-Big-Mac muffins and other wonderful sugar laden foods. 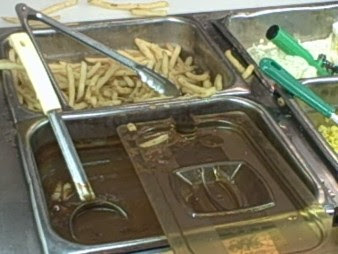 I've got to ask again, why are our hospitals serving such unhealthy foods? I can only think of two arguments. The first is the, "we need them to make money" argument. I have a tough time with that argument. Frankly folks in hospitals are fairly captive. There simply isn't anywhere within walking distance (aside from the chip truck that parks by the Heart Institute) to buy food and therefore if the hospital decided to eliminate unhealthy foods from its premises, people would still need to eat and with some effort, thought and creativity I'm quite confident that the cafeteria could manage to serve up exclusively nutritious fare. The second argument is the, "patients and their families need comfort foods". The non-urgent emergency room folks who certainly don't need comfort because their problems aren't urgent. The urgent emergency folks whose problems are too overwhelming to worry about food at the moment. Admitted inpatient folks - who may well need comforting but their families and friends can certainly bring in any foods from the outside that they want including comforting junk. Allied health professionals and hospital staff where again, comfort's not an issue. At the end of the day it's pretty simply math for me. A hospital should not be serving foods its doctors and dietitans wouldn't recommend to their patients. Or at the very least they should post nutritional information such as calories, trans fats and sodium smack dab on the menu boards so that patients have a fighting chance of navigating through the far less than ideal options. Sure is a shame you've got to fight to eat healthy in a hospital.